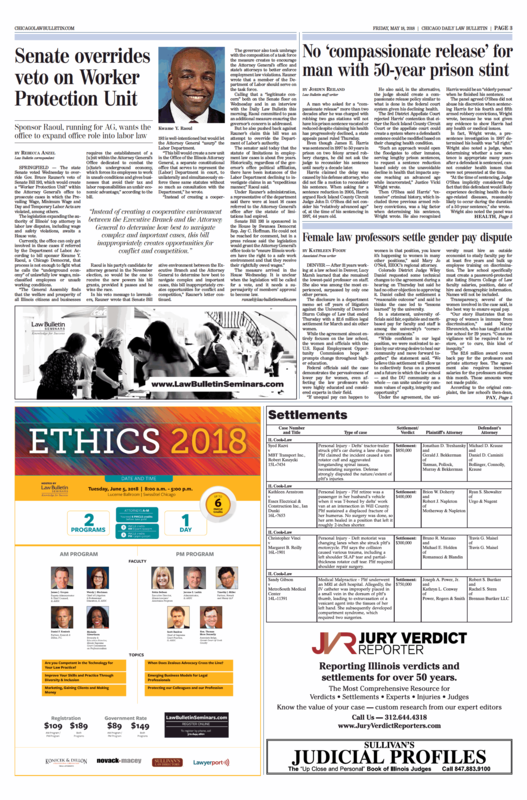 The Chicago Daily Law Bulletin published this piece in print on Friday, May 18, 2018. SPRINGFIELD — The state Senate voted Wednesday to override Gov. Bruce Rauner’s veto of Senate Bill 193, which would create a “Worker Protection Unit” within the Attorney General’s office to prosecute cases in which the Prevailing Wage, Minimum Wage and Day and Temporary Labor Acts are violated, among others. The legislation expanding the authority of Illinois’ top attorney in labor law disputes, including wage and safety violations, awaits a House vote. Currently, the office can only get involved in these cases if referred by the Department of Labor. According to bill sponsor Kwame Y. Raoul, a Chicago Democrat, that process is not enough to fight what he calls the “underground economy” of unlawfully low wages, misclassified employees or unsafe working conditions. “The General Assembly finds that the welfare and prosperity of all Illinois citizens and businesses requires the establishment of a [u]nit within the Attorney General’s Office dedicated to combat the [s]tate’s underground economy, which forces its employees to work in unsafe conditions and gives businesses that avoid their tax and labor responsibilities an unfair economic advantage,” according to the bill. Raoul is his party’s candidate for attorney general in the November election, so would be the one to receive the new powers his bill grants, provided it passes and he wins the race. In his veto message to lawmakers, Rauner wrote that Senate Bill 193 is well-intentioned but would let the Attorney General “usurp” the Labor Department. The governor also took umbrage with the composition of a task force the measure creates to encourage the Attorney General’s office and state’s attorneys to better enforce employment law violations. Rauner wrote that a member of the Department of Labor should serve on the task force. 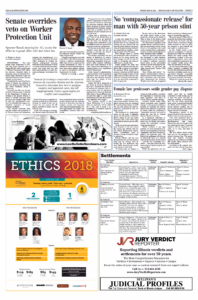 Calling that a “legitimate concern” both on the Senate floor on Wednesday and in an interview with the Daily Law Bulletin this morning, Raoul committed to pass an additional measure ensuring the governor’s concern is addressed. But he also pushed back against Rauner’s claim this bill was an attempt to override the Department of Labor’s authority. The senator said today the statute of limitations in employment law cases is about five years. Historically, regardless of the governor’s office political affiliation, there have been instances of the Labor Department declining to investigate claims in an “expeditious manner,” Raoul said. Under Rauner’s administration, a representative of the department said, there were at least 16 cases referred to the Attorney General’s office after the statute of limitations had expired. The measure arrived in the House Wednesday. It is unclear when the legislation will be called for a vote, and it needs a supermajority of members’ approval to become law.